What's your delivery area? Do you offer discounts? We offer free delivery/setup/pickup if you are within 15 miles of zip 60051. See the area map below. Areas beyond that are charged a minimal delivery fee. Take $15 off each additional bouncy or 30% off the second day! Our standard rental time is 8 hours. We usually deliver and setup between 7-11am so you might get the bouncy a little longer at no charge! Please note that forest preserves and parks usually close at dusk so we will arrive for pickup before then to assure we are out in time. $50 after the first 15 min, then another $75 for every hour after that. Inflatables range from 100-250 lbs. You will need a truck or large SUV and a dolly to pickup. Please watch our safety video below on how to roll up the bouncy for return. Stakes will be included you MUST stake the unit down when you setup, even if it's not windy. You will be required to have valid ID that matches credit card info upon pickup. You are responsible for any damages incurred during your rental as per stated in contract. Do not drag or pull the inflatable, you must use a dolly or roll it! Any overnights will be charged $50 extra and must be returned by 6am next day, late fee will incur full rental price if not received by 6am. Yes, we require a $50 non-refundable deposit. A credit card is needed for the deposit. Final payment is due before your event. If you have to cancel your party, the deposit can be applied to your next event within the same calendar year. Weather related cancellations are determined the morning of your event and must fall under our weather policy. Please see below for our weather policy. Once our truck leaves the warehouse the morning of the event, you are responsible for payment in full, no exceptions. If you must cancel due to weather, your deposit may be refunded or applied to a new date within the same calendar year. It must fall under our weather policy below. If the wind is expected to be 20mph or more during the time of your event we will not setup and your money will be refunded. If rain is expected to be 50% or more during the time of your event you may cancel, we will not setup if it's predicted to be 90% or more. If the temperature is expected to be below 32 degrees during the time of your event you may cancel. ***Weather cancellations are determined the morning of your event, we will not issue refunds until the day of your event. Weather is monitored using Wunderground. All weather related cancellations must be prior to delivery by 7am the morning of the event. It is your choice to cancel due to weather; we also reserve the right to cancel if we feel the weather may be too dangerous. Once our truck leaves the warehouse you are responsible to pay in full. Yes, all units are cleaned after every use. We use antibacterial cleaner to ensure that all of our units are sanitized for the next use. Please note a cleaning fee will be added for any excess cleaning situation. A couple examples are: adding water to a dry rental is $100, silly string clean up is minimum $250 up to the cost of replacement. Please help us take care of our equipment as we do for you. What do I need to do to set up the moonwalk? Absolutely nothing, all you need to provide is a standard 120V outlet and a level surface. Please ensure there is enough set up room for the unit, grassy, level area is preferred with no overhead power or utility lines. Please notify us if the unit will be set up on concrete instead of grass. Please notify us if delivery requires flights of stairs or doorways, there may be additional fees. Do you setup in the winter? Yes we are still open in the winter for your indoor events! You will need an indoor space that can accommodate the size of the inflatable (including height), we will also need to know if there are any steps at all, or flights of stairs and how many doorways to get to the setup area. 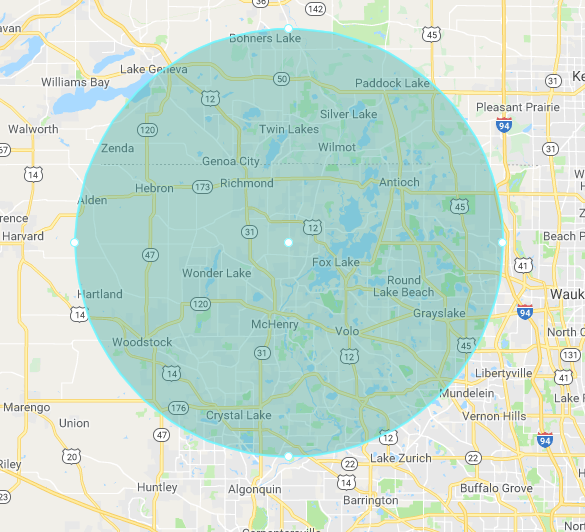 If your party is in a park/forest preserve/public area you must pick a delivery time option below, these types of rentals are much more time sensitive than standard rentals and it requires us to alter the delivery schedule to be to your event on time. Someone must be with the unit at all times from the point of delivery to pickup to avoid theft. If the unit is left alone and is stolen you will be responsible for full replacement cost which can be up to a few thousand dollars. You will need to check with the park for permits needed, electricity and closing times. Rental fees must be paid in full even if your personal generator fails to work properly. Please note that forest preserves and parks usually close at dusk so we will arrive for pickup before then to assure we are out in time. Yes and no. You are not responsible for normal wear and tear on our units. Seams may develop tears in high traffic areas over a period of time. If this happens please alert us at once so we can remedy the situation. If however, damage occurs due to failure to follow our safety rules or negligence (i.e. not turning off the blower in high winds) you will be responsible for all damages up to and including replacement of the unit/blower etc which can cost thousands of dollars. We don't want anyone to be in that situation which is why we have you sign and initial on all of our safety rules so that you can be the trained operator. We also offer an option damage waiver for 10% of the rental fee. This covers all unintentional damage. This does not cover theft or intentional damage. Why is there a fee to setup on a hard surface? Hard surfaces require sandbags since we cannot hammer stakes into it. It's also more wear and tear on our equipment since it's not soft grass. We prefer grass setups as it's easier on our crew and your wallet, but in such cases that require a hard surface setup we do charge a minimal fee for the added work load. We appreciate your understanding. Is is OK to tip my delivery crew? Gratuity is never expected, but always appreciated! If you feel our guys did an excellent job please feel free to tip! They work extremely hard to make sure your party is setup right.